MAMEM meets three remarkable women!!! 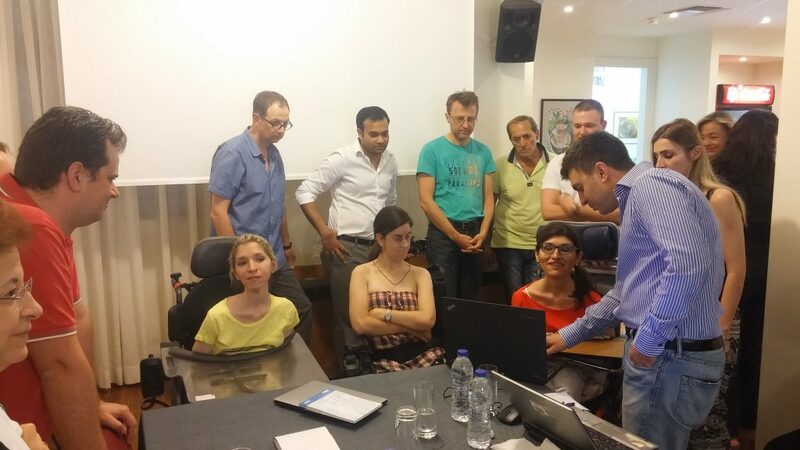 MAMEM’s 4th plenary meeting took place in Athens, Greece. A lot of technical and strategic decisions had to be made, especially with the mid-term review being ahead of us. However, the most productive part of the meeting was the conversations that we had with three remarkable women. Eva, Maria and Argyro are three members of MDA Hellas that agreed to discuss with MAMEM’s consortium and test some of its early prototypes. With Eva working as a graphics designer, Argyro being a teacher in the special school of Ilion and Maria having recently acquired her university degree the expectations that we had to meet was rather high. All three women agreed to test the eye-tracking functionalities using GazeTheWeb browser and managed to accomplish a number of tasks, such as searching the web, visiting their facebook page, reading an on-line book, etc. The GazeTheWeb browser was very accurate for Eva (as she mentioned), while the other women found the use of OptiKey more convenient. In either case, even if still in a early prototype phase, the women immediately recognized the value of such a tool and its potential in helping their every-day life. When the discussion shifted towards the use of EEG devices and its combination with eye-tracking, their re-actions became more enthusiastic but also more skeptical. All of them identified the use of EEG as being complementary to the functionality of eye-tracking and described situations where it could be most valuable, such as when lying in bed before sleeping. Nevertheless, the use of EEG devices has still some barriers to overcome, since (as Eva mentioned) in order to convince a woman to wet her hair and wear a cup you need to promise more than just reading her mind!